Windows Phone 8.1 was announced at the build conference last week with a lot of new features and additions which will bring Windows Phone more closer to other Operating Systems in terms of features and usability. The WP8.1 update will slowly be pushed by manufacturers and carriers (in case of a carrier branded phone) in a couple of months. However, one interesting thing about Windows Phone is the Preview for Developers program which was announced by Microsoft during the announcement of GDR3 update Windows Phone 8. All this program does is to provide an early access to the OS updates when Microsoft is done building them. In short, you get your update before it is approved by your Carrier (Verizon, T-Mobile, at&T; etc) or Manufacturer (Nokia, Samsung, etc). I’ll try to answer a few of FAQs later at the end of the post, but for now – Yes! The update provided under the Preview for Developers is the final finished version of Windows Phone 8.1 – Same that will be given to Manufacturers to install on new phones. Will I still be eligible for Updates provided by Carrier or Manufacturer? What is the difference between OS Version and Firmware Version? If I update, will it erase my data? How much free space do I need in my Phone? I don't want to get Preview. When will Official Update arrive? Follow these simple steps below to get the Windows Phone 8.1 update on your phone via the Preview for Developers Program. If you have any doubt, pay a visit to some of the FAQ’s at the end of this tutorial. You can also feel free to leave a comment in the section at the end of this post. As the program is for developers, the first thing you need to do is to signup as a AppStudio developer. The signup is fully free and only takes a Microsoft Account and a minute of time. Just head over to appstudio.windowsphone.com/Projects/Create (Click on the link or Copy>Paste in your browser). Enter your Microsoft Account credentials to login. Allow your account access to the application by clicking on Yes. Fill in your username and email address in the AppStudio registration form (the default fill should be okay though). Accept the terms by checking the box and click on Register. That’s it for the signup part. After signing up for AppStudio, you need to download the Preview for Developers application for it to connect your developer account with your phone and configure the Update System to provide you with early updates. If you’re reading this article on a PC, scan the QR code below to download the app, else click on the QR code to reach the download page. Upon installation of the app, open it. Read the intro and tap next. Read the Terms and Conditions (if you want to) and tap on accept. 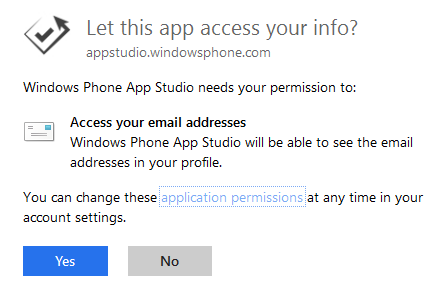 Sign in using the same Microsoft account credentials that you used to signup for AppStudio in Part 1. Check the box in front of Enable Preview for Developers and tap done. That’s it. You can close the app now. All prerequisites for participating in the program are over. Just head over to Settings> Phone update to see if an update is already available. The Preview update is being pushed in two phases. 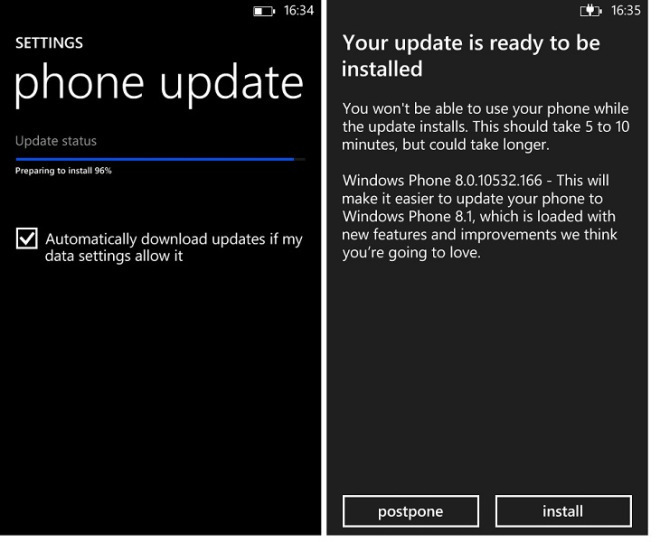 Firstly a tiny update of just a few MBs which makes it easy for you to update to Windows Phone 8.1. Next up is the full WP8.1 Update. Make sure you have a good amount of free space on your phone and charge the battery to at-least half before proceeding with the installation of update. I know you still have doubts in your mind. So here are answers to some of them. You can also leave a comment below. Certainly not! Sooner or later, your phone will receive the same update through your phone manufacturer. Even though the Developer page warns about the warranty, I am sure to say that this does not affect your warranty in any way. This is evident from the fact that during the WP8 GDR3 Preview, there were 0 reports that Nokia Care refused to honour a device’s warranty because of preview. Yes definitely! The preview for developers only includes the Microsoft’s part of the updates and when in future, your Manufacturer and/or Carrier pushes an update, you will be able to receive it and install it normally. However, because you have already update your OS, that update will only update your firmware, core OS remaining same. The OS version is the version of Windows Phone OS that you have. It is basically from Microsoft and stays same for all the devices running that OS built. The Firmware version is the version of the firmware that runs complimentary to the main OS. The firmware may include specific improvements and apps like Camera improvements in case of Lumia phones. No it won’t. The preview update will also be like the rest of the software updates. The update will be downloaded via FOTA and installed on your phone. your apps, messages and everything else will stay in place. Windows Phone 8.1 is a major update to the OS and hence will require quite some space to download, extract and install the update. Keep as much free space as you can, but minimum should be around 1GB. I don’t see a reason why you don’t want to update to the Preview, but if you don’t want to, that’s Okay. You will receive the official update from your manufacturer or carrier in the next couple of months. No dates are announced by any manufacturer yet, so sorry! One thing I can say according to the history is that HTC devices will be the first ones to receive official uupdates as HTC barely makes any changes with its firmware. Detailed timelines are not yet available. It should be available for most devices in Q1 2015. Thanks buddy very helpful !!! Cyan is not yet available for Lumia 720. Check there. I have the developer preview 8.1 installed on my 1020. my question is , will I still be able to get the full update when it is released ? Yes you will. As soon as Microsoft pushes the Cyan package, you will receive the same. Does it show that “No new updates are available”? Do you have a working WiFI connection? Try rebooting your phone. If it still doesn’t work, wait up and try tomorrow. You shared a good information. really helpful. Thank you. hope you keep updating good information. Nice job dude…tried it on 720, 820, 520 and 1020….successful.. fantastic…but for me the Extra&Infor still shows Lumia Black while its in 8.1, cortana works fine…but does it really need to show Lumia Cyan which is what’s on my 630 Win 8.1?….Rocking it anyway. having owned an htc radar and been screwed by MS on windows 8…i bought the 8x as a 2-3 year investment…it wasn’t cheap at just sub £300…i now wonder whether I am going to end up as another schmuck that didn’t follow the obviously preferred Nokia route. So far…wp8.1 has been as stable as one could hope, last few days have seen random system shutdowns. No sign of Cortana for uk or Europe 8x owners due to lack of native us language support which was not included with these models. Really does feel like a punch in the goolies and trying to find firm information from anybody regarding the update rollout is proving illusive to say the least. Any one interested in seeing the transcript of the HTC convo…just let me know. Thank you for finding time to write this comment. Back in Feb, HTC was quoted as saying that they were working on to bring the 8.1 update to the 8X. I don’t know why HTC will not push the Windows Phone 8.1 update anymore now. Unlike Nokia, they hardly add anything to the firmware and it is vanilla Windows Phone at the most part, except for a few apps. So dunno what is stopping them from pushing out these updates. Maybe they are giving up on Windows Phone already and won’t spend on supporting the devices anymore? Regardless of their statement, I think the update will still be available to the devices already using WP8.1 DP, if ever they decide to push it. It happens like that with Nokia devices and how is HTC any special? =>> I reached out to the HTC support here in India and they were pretty clean at saying that the update is provided by Microsoft and they have no role to play. I don’t know how far this stands true though. I can understand the frustration of finding out that your OEM does not support your device anymore. How about flashing the 8x with a US based ROM and hence getting the US language support? That will allow you to use Cortana and other features which are limited to US for now. That HTC statement will help in creating a media buzz and hopefully force HTC to issue a press release about the status of the update. Can you mail it to narender@techmesto.com? I will try to push it to high authority sites like WPCentral and WMPU. Then you need to delete some items (apps or games) from your phone memory to free up space for the update and then try updating again. When i chack for update msg show we are currently unabe for updates 80072ee2.pls help me sir what is this. It might be an issue with your connection or else an issue with MS’s services. Try again tomorrow. My self ,im harminder from india and i am uesing lumia 720, i do all all this three steps as ypu say but after i chack far update my phone show ‘your phone is upto date’.pls help me how can i update windows 8 to windows 8.1. Open the Preview for Developers app. Is the box checked? Sir, I have update my nokia lumia 520, Now itz show lumia black in about phone. This update give no offer STORAGE SENSE to move app from phone to SD card..
please reply.. What should i do.. 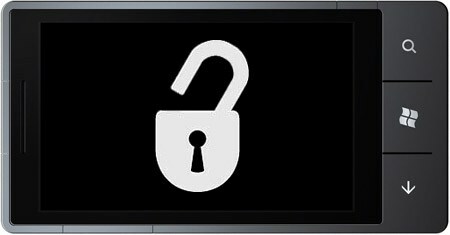 I have unlocked phone with devloper tool. Then you don’t yet have the WP8.1 update. Try checking for updates again. u r awsome 😀 😀 😀 successfully updated after three tries 😀 should i uninstall develpor app now? I’d recommend not to so as to continue receiving future updates. If you remove it, you will no longer receive early updates to the next releases. hey i am using lumia 710.pls tell me if it is possible to install windows 8.1 developer preview. You did a really grt job.. even the description provided is very crisp and clear and easy to understand. thanks a lot again. have a grt day..
will it affect the warranty of the phone provided by manufacturer ? Connected to wifi, though the update is not available! Now I get “error 80072ee7” message?! What is this? Why can’t I update my phone to 8.1? Got two updates before the actual 8.1. Still i don’t have the 8.1. Is it necessary to change country, language, etc.to US?? Or after the update I can change it to India? Reply ASAP. Thanks. Have you tried updating the 3rd time? You don’t need it as US. It is only needed if you want to use Cortana. how much big that update will be…….upto how much mbs?? It’s around 400MB, I guess. Its only available in the US. Have you tried this? Is it still offering you updates? Im using Lumia 720 n recently had a black update. may I know wetha CN i update my phone to WP 8.1 ? my phone recently got restored to factory settings . i read your article and update my phone to windows 8.1 version . 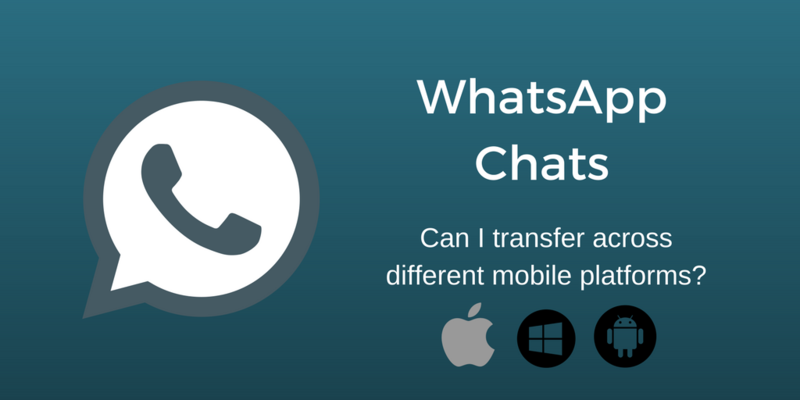 its cool , but i cant find whatsapp for my phone , and thats really saddening . can you help me out with that ? That’s sad actually. WhatsApp has been pulled from the WP App store since around a week and there is no update about the same. This is not an issue with WP8.1, but any Windows Phone user who tries to re-install WhatsApp will face this. Wait up for it to be made available again. Unfortunately, it is not. There is no file manager, hence OTG support was not implemented either. I am doing ur process third time (download) in lumia 520 may i know tha shall i get 8.1 for it or not plz tell me? It probably didn’t update yet. Please try updating another time. dude hw can i get transparent tiles in my nl720 ??? If you set a background to your start screen, most of the system apps will keep the transparency. For the others, wait for the developers to update their apps with a transparent png for the Tile Image. Transparency Tiles can help in the meantime. I have updated 8.1 for lumia 525. I did everything that was mentioned in your page. The installation showed complete. But after that, there seem to be no change in my Lumia 720. Everything is the same. No notification bar.. Nothing at all. I did tat twice, i mean i updated it twice bt still der seems to b no change in my cell. it simply showed that i will be notified for the new update for 8.1. it brought no change to any aspects of 8.1. I did all those settings which hav been prescribed by u… Installed preview for developer app too. Then i went in back to settings – phone updates n when i check if iv gt an update it says u device s already upto date…. Whereas me n my friend use the same Lumia 720, n he eventually got the update and i dint. When i get it so?? Uninstall Preview for Developers. Download it again and login again. Make sure that the checkbox there is checked. is this working for lumia 720 as whosoever has done on 720 , dint get the update. It is working for the 720. Check this comment. There does feel a difference in speed for a while, but the overall experience is worth it. After updating to 8.1, I feel my phone 720 got slowed down a bit. Not sure if this is right. In continuation to previous post after the restart another 2 MB update is being pushed. My ph is still on Lumia Black. 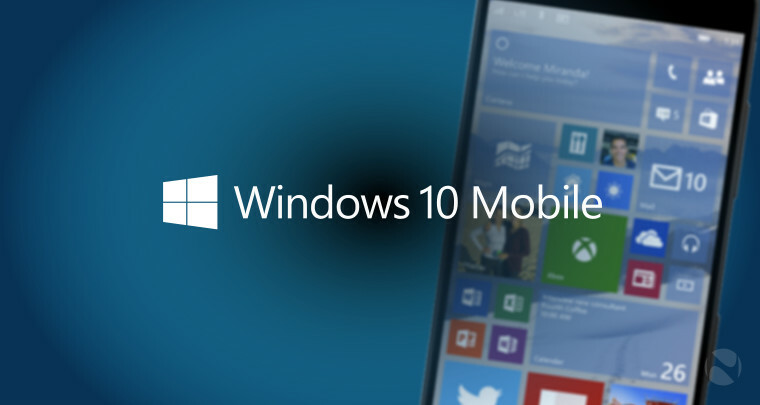 Did you receive a message that your phone is now ready for Windows Phone 8.1? You need to update yet another time. This will be the final big update. First of all thanks for such detailed steps. it’s ask wifi connection to update.is any other way to update without wifi? Nops. Unfortunately, you need WiFi connection to update as it involves transfer of big amount of data. can update to lumia 525? i did d following steps said by u but dere is no difference in my lumia 720 what shall ido now? Thanks for the post! I am facing a problem here. When i tried to download Preview for Developers app scanning the QR code, it says ‘this app is not available for your phone’ I am using lumia 710. Please help. Surely, Tiru. Yours is a Windows Phone 7.5 handset which can be max updated to Windows Phone 7.8. You device does not support WP8.0, hence same is the case for WP8.1. You shouldn’t expect any more updates. heh i got the first update tat is of few MB and later the second big update with restart , transferring data (step 2 of 5)…. As it got 100 percent completed it said update successful with DONE option…. Haven’t you got any new features that are included in the WP8.1 update? What is your present firmware number now? Steps after the 2nd are pretty quick and take only a couple of minutes to finish. 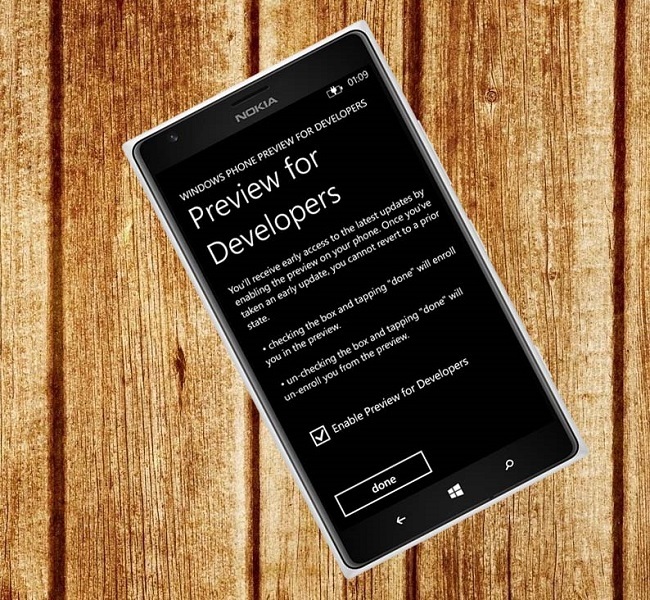 Have a look at the Developer Preview release of windows phone 8.1 Running on Noki Lumia 620. This includes features such as. Sorry, a noob question, it will work on a windows phone 7.5 mango? the phone is a ZTE TANIA. Unfortunately not. It is only for Windows Phone 8 handsets. The previous devices are not getting any more updates. I have never seen this type of MIGHTY comprehensive concise step-wise lesson for windows 8.1 application installation. Your explanation is as good as the application itself. Thanks for being there for us; I appreciate. Nice! Hope you’ll like her 😛 BTW if you are unable to get it, we have a guide here. Hi, can I switch back to windows 8 from windows 8.1? Any method for solving this issue and switching back? The only way to go back is by flashing the phone back to the stock Windows Phone 8 ROM. But this will cause you to lose all non-backed up data from your phone. So be careful before continuing as you will be needed to download your apps and setup everything again. It’s a nice update..but I have lost my photos..can I back up or how can I get them..i have sone data left and some erased.please elobarate on the solution.. Your data shouldn’t have deleted in any case as it is just an update. About your photos, can you tell where they were stored and what was their origin? Were they taken using your phones camera? Please check your memory card and phone memory by connecting it to pc. Also if you had auto upload enabled, check your OneDrive. MS will push another update to WP8.1 very soon. Wait for that and maybe it will solve the installation issue. It is around 500 MB, I guess. Not so sure as it never showed the actual size. Thnx fr d help. I did it as per d steps but during the 3rd update my phone shows error after few %. I tried it 5-6 times, always after few % it shows error. That’s strange. Actually very strange. Try restarting your phone or a soft reset. I did everything that was mentioned in your page. The instalation showed complete. But after that, there seem to be no change in my Lumia 720. Everything is the same. No notification bar.. Nothing at all. Am I doing anything wrong here? As I noted in the post, there are two updates. The first one is just a preparatory update and you need to goto Settings> Phone Update after the first update to get the final 8.1 update. after completing the first installation on my lumia 720, when i checked for 2nd update, it continually displayed “checking for updates….” for nearly half an hour but nothing happened, it kept on showing that…..? Can you try after a restart if that helps? Head to Settings > Phone Update and check if it shows an update now. It seems you are going through more preparatory updates than what most of us went through. That’s a Great Post 🙂 Clear step by step Process. would you like to add the company account for Microsoft corporation? Would you please can any any one help? Thanks a lot in advance? I am not sure what certificates are you referring to. You surely won’t have any company account login because they are only setup by a few companies which bulk purchase phones for their employees.